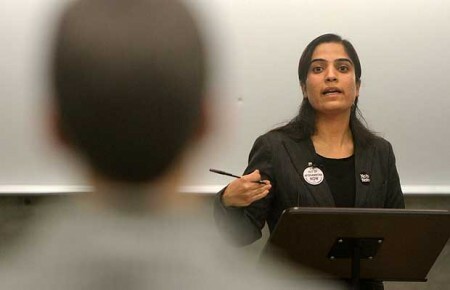 Malalai Joya – (Wikipedia) an Afghan activist, writer and former politician spoke this evening in Burlington on the UVM campus. She is an outspoken critic of the Afghan government and the warlords that are embedded within it, the Taliban and the US/NATO occupation. She planned to came to the US for a three week speaking tour, but missed the first week of the tour because the State Dept. refused to grant her a visa. After pressure from many groups, they relented and granted the visa. The US used the umbrella of the UN to invade Libya, just like it did in Iraq. Obama rails against Gaddafi, but not the brutal regimes in Israel, Yemen, Syria and others. Democracy doesn’t come by invasion, cluster bombs and war machines. Many Afghan people, students rally against the occupation, but it is not reported. There are three forces battling within Afghanistan – the Taliban; the government and warlords; and the US/NATO occupation. The US and NATO need to leave immediately so the people of Afghanistan can rebuild their nation. While there was great passion in her speech, there was very little emotion. I was a bit surprised by this. She took questions from the audience. The first questioner asked why she was in favor of the US leaving Afghanistan, the Taliban are against women’s rights and if the US leaves, they will retake control of the country. When she started to answer his question, he interrupted her because she didn’t directly address his question right away. The crowd got a bit agitated, and Ms. Joya showed the spark that I expected to hear from what I had read about her. She showed pictures of the effects of US and NATO bombings on women and children. With great passion and emotion, she told the gentleman that the only way the people of Afghanistan can be in control is if the US and NATO leave. She knows that things will not change overnight, but she believes that the people of Afghanistan are ready to control their destiny.They have seen civil war and do not want it again. She told him to walk in her shoes and try to understand what it is like to live in a country where the people have no control over what happens. Later, she talked about not trusting what you hear in the media about Afghanistan. The US interests are for control of bases in order to project power into the region and the ability to have access to minerals and central Asian oil. One of the audience members talked about the Afghan Women’s Writing Project. It is an online magazine that allows Afghan women to share their stories with the world. Please take the time to read some of their stories. To many, Ms. Joya is a hero for standing up to the warlords and corrupt Afghan government. I’ll end with her own words talking about her heroes. ‹ Gov. Shumlin Flip-flops on Taxes?! ?